Il Trovatore presents many challenges for the director. With its wildly implausible story line, puzzling ellipses in narrative, and constant shifts of location, it's hard to make the opera coherent or comprehensible, let alone believable. Too often the work is dismissed as a ridiculous potboiler, Verdi's relapse to the "bad old days" when tuneful, stirring music trumped any concern with dramatic viability. Nevertheless, modern directors have embraced the opera, in spite or perhaps because of its difficulties. Some update the action to a different historical period in order to provide a context for the work's unbridled violence and eroticism. For other interpreters, though, the opera's wildly melodramatic improbabilities suggest a dreamlike atmosphere, prompting visual approaches freed from conventional realism or narrative logic. The following article will examine several recent productions and the ways different directors have tackled the challenge of Il Trovatore. In the interest of full disclosure, it should be mentioned that this will be a survey, based on research, rather than a set of first-hand reviews. Hopefully, though, these brief descriptions will help indicate the widely varied staging possibilities for Verdi's masterwork. 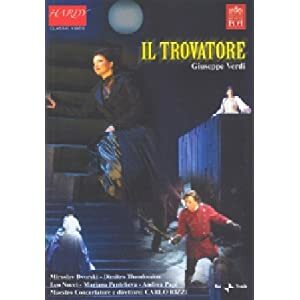 This is a poorly known production from the Teatro Comunale di Bologna, from April 2005, conducted by Carlo Rizzi, with Leo Nucci as Il Conte di Luna, Dimitra Theodossiou as Leonora, Mariana Pentcheva as Azucena, Miroslave Dvorski as Manrico, Andrea Papi as Ferrando, Bernadette Lucarini as Ines, Enrico Cossuta as Ruiz, and Rafaelle Costantini as the old gipsy.